Here you will find information concerning our church and its ministries. We hope your time spent at our site will be a blessing. Our intent is to be missional to the community. Feel free to browse through the various areas of our website and learn about our fellowship. As children of God, we are guaranteed an inheritance, which cannot be comprehended. Our church family will spend eternity together with Jesus. Each time we add to our church, we add to the family of God. Our mission is to love the people lavishly and preach the Word faithfully. "How great is the love the Father has lavished on us, that we should be called children of God." "Loving the people lavishly-Preaching the Word Faithfully"
A huge welcome to Branden and Sarah Handke! We voted to call Branden and Sarah to come and work in youth ministry with our 6th-12th grade students. We are looking forward to them joining us as of May 1st. We are excited for this addition to our ministry team and hope everyone will give them a warm Hominy welcome! Please be in prayer for our nominating committee as they seek to fill all the positions in the church for the new year. Members are Traci Clemishire, Dustin Hough, Jasin Johnson, Susan Smith, and Jeff Lay. 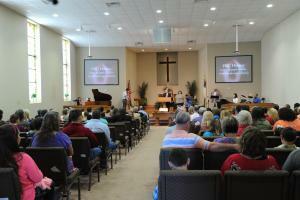 "FBC Hominy" page for general news, pictures, and announcements. "FBC Hominy Students" for news and events relating to students 6th-12th grade. "FBC Kids Rock" for news and pictures relating to 3rd-5th grade. It's time again for the annual Annie Armstrong Easter Offering. 100% of this offering goes directly to support more than 5,000 missionaries in church planting and compassion ministry. Please be in pray and give as God leads you. Our church goal is $1500. We as a church are committing to praying for our North American Missionaries this year. Each week we will focus on a different missionary or missionary couple. We will also send them a letter letting them know that they are in our prayers. It is very easy to become discouraged in the mission field and we are hoping to provide support and encouragement to those who are willing to go and spread the Gospel. Please pray for these and sign the letter in the vestibule each week.